In the beginning I knew no more about the history of the band than what was in the brief notes that came with two compilation cd's. Ever since I had discovered Van der Graaf Generator (in the Genesis biography by Armando Gallo) I had tried to put together a picture in my mind about how it all had been. The public library had biographies about many different bands, but none about Van der Graaf Generator. And only some of my questions were answered by the brief notes in the two cd's, First Generation and Second Generation, which mostly dealt with the line-up. I knew already that for instance the bassist from the first albums had rejoined the band for their last albums. And I knew the band hadn't been together from 1972 until 1975. But I wanted to know how and most of all: why. I waited for fourteen years, until in 2000 the four cd box called The Box was released. The most important reason for me to buy it, apart from completing my collection, was that it came with a small book about the history of Van der Graaf Generator. That made me happy, but it didn't still my hunger for information about my favourite band. Then I waited another five years, and in 2005 found out about the book called The Book. At last, at long last there is a biography about Van der Graaf Generator! I immediately bought it and read all (about) 320 pages in just a few days. It is a big, heavy and all-embracing piece of work, chronologically told from the formation in 1967 until the end in 1978 (with an epilogue about the Present in 2005). By no means The Book is a dry collection of facts. Nothing whatsoever. Only a few pages into it I was struck by the combination of it being a thorough source of information and at the same time being A Book, that is to say, it is written like a good novel, with cliffhangers, psychological insight and a good portion of humour. It is so well written I just wanted to read on, and not to dwell too long on some difficult paragraphs. The second time I read it I was able to relax and sit back and take notes. After that I had only a very few nutter questions left. Shortly after I was already completing my third read of it within six weeks. I have learned the inside story behind the Van der Graaf Generator-roots in the sixties, the connection with Jimi Hendrix and Arthur Brown, and what exactly Judge Smith was doing in America before coming back and coming up with the name of the band. I know what started David Jackson to play two saxes simultaneously, and how Hugh Banton came to play bass pedals. I know all there is to know about the famous Six Bob tour. I know what the members of the band did in the in-between-years from 1972 until 1975. I know how, why, where and when they reformed, and how Godbluff was conceived. I know about the connection of Van der Graaf with punk. And I now know about the musical activities of all of the members outside Van der Graaf Generator. I know it all. The writers, Jim Christopulos and Phil Smart, have succeeded in interviewing an enormous number of people, amongst whom, apart from the band members, Peter Gabriel, Arthur Brown, Hugh Hopper, Gordian Troeller, George Martin and Paul Whitehead, who all have very interesting stories to tell. Stories which, upon reading them, makes one wonder why they were never written down before. An abundance of small, detailed recollections succeeds in giving colour to these far-off days. I learned about the games they played, the equipment they used, the fun they had writing, rehearsing and performing, and the general atmosphere of the seventies. And then there's the pictures! Many beautiful pictures that stick to mind after only having seen them once. There's too many to mention. The first example that springs to my mind is a picture from inside the tour-bus of David Jackson and Hugh Banton in conversation, holding some cable from some complex piece of equipment, while Peter Hammill is in the background reading a book. But there's also a picture of the announcement for the very first Van der Graaf Generator-gigs. There's one of a very young Hugh Banton with his piano and organ teacher. Pictures of the roadies, pictures next to the van, inside hotel-rooms. Pictures of the four, rehearsing for Godbluff. Guy Evans riding a bike. And there's the most beautiful and interesting reproductions of tour date sheets (with lines such as Wednesday 17th May 1972: "If Kooky is not at the airport to meet you please get a taxi to the Zoom Club. Kooky's phone number is: Frankfurt 281434. He is booking the hotel for you but you are paying"). If you claim to know anything about Van der Graaf Generator at all, you just can't afford not having read The Book. I can't deny I'm still hungry for information. The only criticism about The Book I can think of is: it's too short. I would have been happy with double or even ten times the present size. But it's a book I will be reading for the next twenty years before there'll be a need to dig deeper again into the history of Van der Graaf Generator. 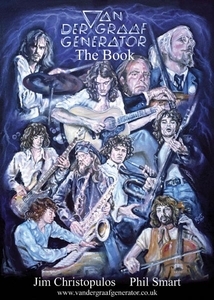 The Book is just as essential to any musical collection as any of the records by Van der Graaf Generator. Van der Graaf Generator - The Book can be ordered from this page on the Van der Graaf Generator website.